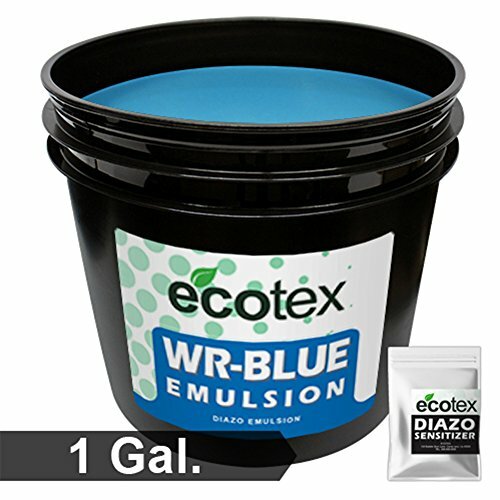 Ecotex WR-BLUE is the ultimate Water Resistant Diazo Emulsion. This textile emulsion is highly resistant to Plastisol & Water Based inks. Before use, Diazo must be added and allowed to activate emulsion. It's easy, just see Diazo for simple Instructions. Once the Diazo has been mixed it is ready for use. Apply to clean, degreased, dried screen with a scoop coater. Be sure to use appropriate application techniques. Reclaiming Ecotex WR-BLUE is easy with Ecotex Emulsion Remover. Keep in a cool area, emulsion will break down much faster in heat. Keeping emulsion in a fridge can help to give a slightly extended shelf life, however, emulsion that has gotten to the point of freezing will no longer work properly and must be replaced. For long runs use Ecotex Emulsion Hardener to extend the life of your stencil. Made In USA | 100% Satisfaction Guaranteed or Your Money Back!k!